I've been carrying around two phones for most of this year, my trusty Blackberry and the Google phone. I use the blackberry for voice, text, and email and the Google phone for web, maps, and apps. I'm getting pretty good at typing on a touch screen but I still cannot type a three or four paragraph email easily on the Google phone and until I can, I'm not walking away from the Blackberry. I do occasionally use the Blackberry for mobile apps and my two favorite Blackberry apps are SocialScope and Foursquare. I've been using both of these apps since they were in alpha and they have improved a lot over the past six months. They are now rock solid. This week The Gotham Gal got a new Blackberry, the 9700, which is what I use. It's a mighty fine phone. This morning I installed the Blackberry App World on her phone (it's crazy that it does not come pre-installed by T-Mobile). 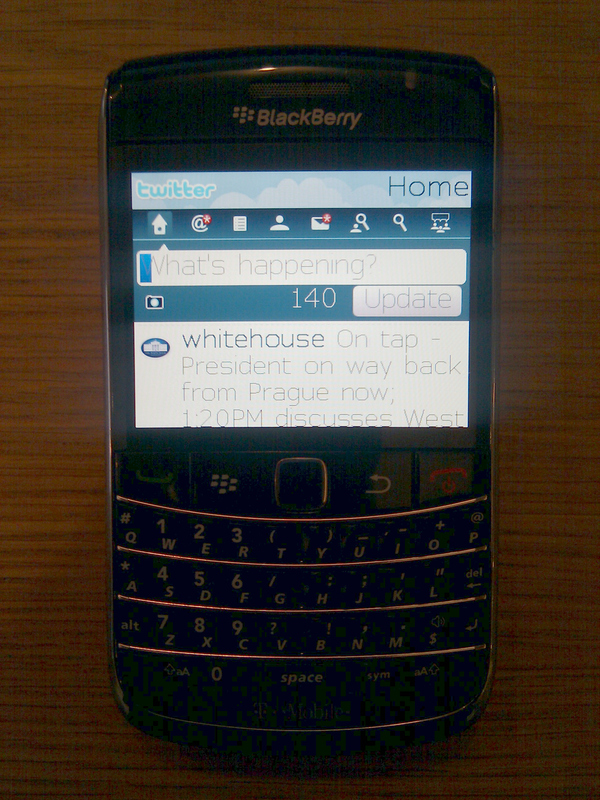 Then I installed Foursquare and the new Blackberry Twitter app. You'll find the new Twitter app in the Test Center category in App World. After I did the install, I played around a bit with her Twitter and Foursquare apps. It occurred to me that with the arrival of rock solid apps like the new Twitter app, Foursquare, and SocialScope (which aggregates all of these services into one app), the Blackberry has become a damn good mobile social media device. The only thing that it is missing is a good Facebook app. The current one is not great. Blackberry has a bunch of catching up to do to stay relevant and one important thing is getting really great social media apps on its platform. My sense from this morning's experience is that they are getting there. And not a moment to soon.